powders, granuler and free flowing products. 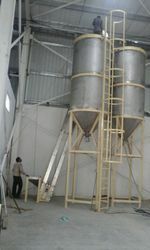 Silos for Food grain, Food products, Chemicals, Plastics and polymers, Cement and building material. 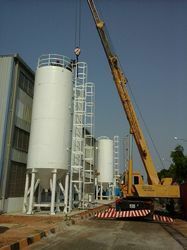 Silos of MS, SS, GI, Coruugated, FRP coated. Flat bottom, Conical bottom, Vertical , Horizontal etc. We are also engaged in manufacturing, supplying and exporting a wide range of Steel Silo. In accordance with the international quality norms, these Silo are designed and developed using premium class materials and modern technology methods. 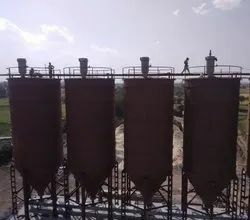 These Silos are widely demanded in various industries for their smooth performance, easier operations, less maintenance and longer serving life. 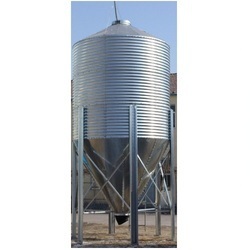 We design and manufacture MS Steel silo for different application. We are also engaged in manufacturing, supplying and exporting a wide range of GI Galvanized Silo. In accordance with the international quality norms, these are designed and developed using premium class materials and modern technology methods. GI Galvanized Silo are widely demanded in various industries for their smooth performance, easier operations, less maintenance and longer serving life.